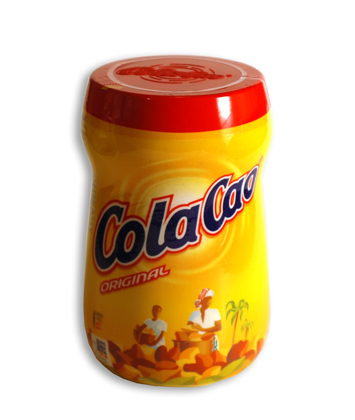 The 'Cola Cao' Original is the "ideal breakfast and snack" that cannot be absent in your house. A product full of flavor, energy and vitality, ideal not only for the youngest, but for all the adults that grew up with it and have been missing it. 12.3 oz Instant thick chocolate, to enjoy with "churros" (fritters). Vichy Catalán is a mythical brand among European mineral waters. The naturally sparkling water wells up from the depths of the earth at a Catalán hot spring that has been renowned from antiquity. It has a remarkable mineral content of bicarbonates, sodium, chlorine, potassium, fluoride, calcium, magnesium and lithium. 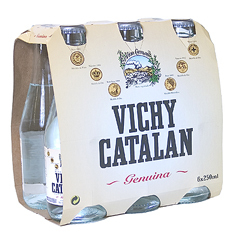 Its quality and components make Vichy Catalan water a truly delicious and refreshing drink to your health! 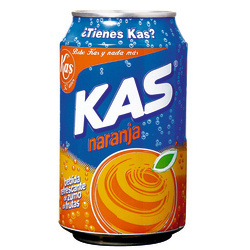 'Kas Naranja' is a sweet and bubbly soda, very popular in Spain. 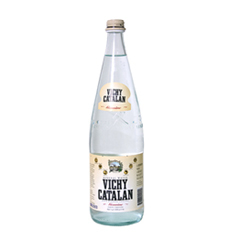 'Vichy Catalán' is a mythical brand among European mineral waters. The naturally sparkling water wells up from the depths of the earth at a Catalán hot spring that has been renowned from antiquity. 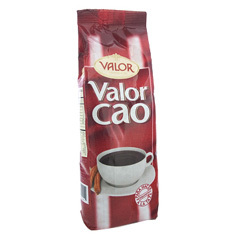 'Valor' Cao, powdered cocoa mix ready to stir in hot milk. Keeping an ancient recipe, it is very popular for dipping "churros" (fried pastries) in a cup of this hot beverage on mid-afternoon snacks. Makes a great delicious chocolate brew, suitable to enjoy in a rainy day! A healthy sweet-tooth satisfier that pair well with cheese or hold their own on the dessert table. These 100% natural fig "breads" come to us from the hilly terrain of La Vera in the Spanish region of Extremadura. Matiz Fig Bread uses only the finest plump figs combined with walnuts, honey and natural spices. Figs, walnuts, honey, granulated sugar w/ essence of vanilla, cinnamon. Best selection of honey from eucalyptus, linden and other aromatic plants. New non-dripping format. Linden honey 45 %, eucalyptus honey 30 %, blossom honey. 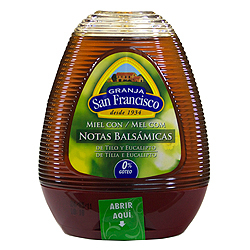 Classic blossom honey with the quality of Granja San Francisco. 350 g - 12.3 ozMediterranean rosemary and lavender honey from 'Granja San Francisco'. A delightful taste of Rosemary, Lavender (Espliego,) and other Mediterranean plants. It is ideal with nuts, yogurt, fruit, cheese, bread toasts or cereal. Rosemary honey 45%, Lavender honey 30%, blossom honey. 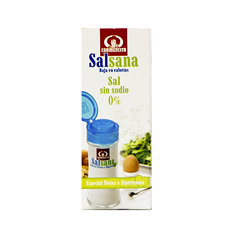 Salsana is a 0% sodium salt, which avoid liquid retention. This salt can be used as regular salt both for cooking and table by people with high blood pressure and for low sodium and low calories diets. The classic Maria cookies with no added sugar. No sugar added. This apple jam is made with fructose which makes it great for sacarose-free diets. Its quality is guaranteed. 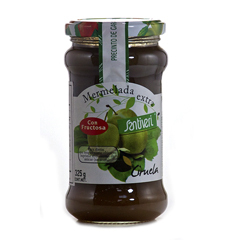 'Santiveri' is one of the leading companies in natural and dietetic products in Spain. Fruit preserves make great light dessert alternative. Quince Cream is one of them...and very traditional too! Try this sugar-free selection on bread toast or with soft cheese.